Art. It is both an act(ion) and an end-product. It is a tangible, aesthetic engagement and an ineffable, abstract concept. These multifarious and oftentimes contradictory descriptions of art are exactly what makes it so compelling: the lack of a singular definition or rigid parameters force us to scrutinize our assumptions about what it is, as well as its place in the world around us. To this end, art is a challenge to our senses, sensibilities, and sense of self in the world. The Porsche 911 (and, to a lesser degree, the manufacturer’s other models) has not infrequently been called a work of art. And the German automaker regularly fosters and promotes this belief. For example, during the roll out for the new Porsche 911R, an article in Christophorus, titled “The Art of Reduction,” focuses on how designers and engineers streamlined the R-model in order to capture the “essence” of its forebearer: the 1967-version. Such a task, to their mind, was nothing less than an act of art-making resulting in a minimalist, aesthetic masterpiece. Similarly, when Porsche unveiled their Black Edition line in 2015, they promoted the models’ “high aesthetic standards” through a marketing campaign that featured a “digital showcase” of three contemporary artists. By placing the Black Edition vehicles in the same context as the work of these three men, Porsche developed an unambiguous association between them. To wit, they argued: these cars are works of art. Of course, the through-line between Porsche vehicles and art-objects is not just a marketing ploy that the Ad Men in Stuttgart began drawing over the past few years. 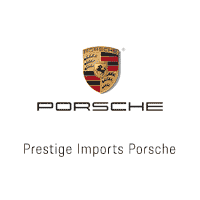 In fact, the relationship between the Porsche brand and works of art has been a mainstay of the German automaker’s promotional platform for years. At the 00:18 mark, he says: “We all have a desire to create something to show we were here and did something of value. To create something timeless.” After a brief sequence of early-model Porsche vehicles ripping around race tracks, he continues with his monologue. At the 00:41 mark, he claims: “For something to endure, it must be unique; yet so universal, anyone can appreciate it.” While he never explicitly uses the word “art,” these declarations seem to encapsulate the motivations that embolden most artists, in addition to serving as a litmus test for what constitutes art. With this conceptual milieu and marketing framework in place, it’s no surprise that contemporary artists have engaged the Porsche brand and its surrounding aura in order to develop their own ideas vis-á-vis art. One such artist is Chris LaBrooy. According to his website, LaBrooy uses 3D technology in order to “explore CGI as a creative medium in itself with which he could subvert and twist familiar everyday things into new typographic and sculptural forms.” While LaBrooy has developed a slew of compelling art-projects and marketing campaigns, his most recent endeavor focuses on the Porsche 911. Additionally, the videos challenge us to re-conceptualize the notion of materiality as it relates to automobiles. One, no doubt, does not expect a car to bend or bounce as they do in the clips. Of course, these videos engage “real life” concerns of the automotive industry, as manufacturers transition from steel to aluminum, carbon fiber, and plastics. Yes, my friends, that is a 1979 Porsche 911 SC smashed to smithereens below what appears to be a concrete, highway divider. But before you start thinking that this ad is simply a display of digital trickery and that, heavens, no one in their right mind would willfully demolish one of these naturally-aspirated beauties, watch THIS VIDEO. Why is all this important? Well, Rag & Bone positions itself as a young company founded by outsiders, promoting a clothing line that cultivates an edgy British/NYC aesthetic. To this end, they’re attempting to increase their marketing share (in a no doubt crowded industry) by fostering an aura of rebelliousness. The smashed Porsche, then, signifies the destruction of established brands that, more often than not, associate themselves with old money. Furthermore, one also could argue that Rag & Bone’s UK/NYC affiliations are at odds with Porsche’s German origins. As cultural centers, Deutschland and The Big Apple engender drastically different imaginations of home. Independent of the aforementioned issues, though, the image questions, rather evidently, the prominence placed upon luxury goods and services. Why do these items generate a sense of self-worth and accomplishment in both Western and global culture? Why do some objects, and not others, attain this elite status? Additionally, the image raises questions about beauty’s purpose and the “freedom” to destroy that which we find aesthetically pleasing (or personally valuable). Regardless of what stance one takes on these issues, the images of LaBrooy and the Rag & Bone ad only function successfully because we consider the Porsche brand, particularly the 911, a rarifed object worthy of veneration. In other words, these derivative projects only succeed and compel our attention because we, as a culture, agree that the Porsche 911 is an art-object. I mean, no one’s creating (or destroying) art that focuses on RAV-4s. Well, at least not art that glorifies or challenges our perceptions/reception of them. 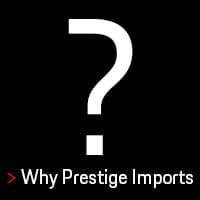 If you’re considering an investment in a four-wheeled art-object that bears the Porsche badge, visit Prestige Imports at 9201 West Colfax Avenue. 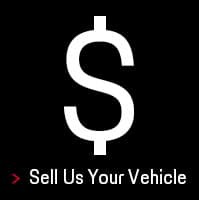 We’re located between Wadsworth and Kipling in Lakewood, CO. You can also call 888.737.1724 to speak with one of our Porsche Brand Specialists and schedule an appointment. Banner image a modified version of chaseiv57‘s “paint splatter,” courtesy of Creative Commons. 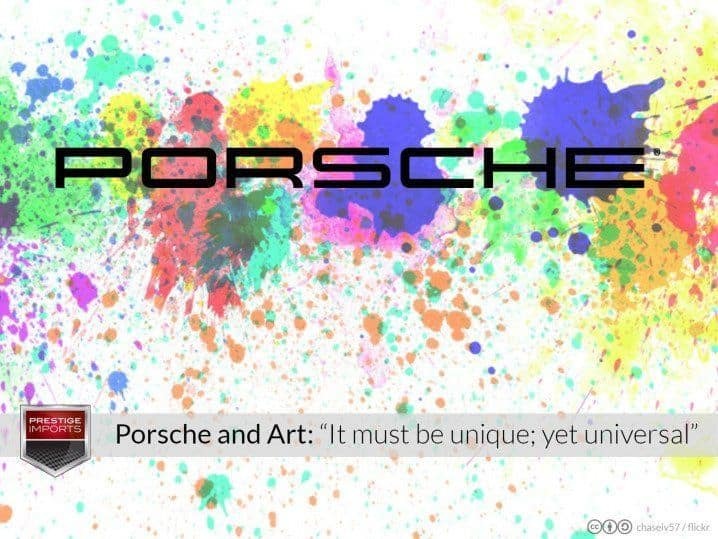 The article Porsche and Art: “It must be unique; yet universal” originally appeared in the Prestige Imports Learning Center.